Michael McFadyen's Scuba Diving - Shark Inn This is a very good dive site, one of many found in and around Port Moresby, the capital city of Papua New Guinea. The main entrance from the open sea to Port Moresby Harbour is called Basilisk Passage. Harry Potter fans will have heard of this name but it is not, of course, named for the creature in the books. Instead, it is named after HMS Basilisk which was skippered by Captain (later Admiral) John Moresby. On 21 February 1873 he entered the passage and name the harbour Fairfax Harbour and the area Port Moresby (after his father, Admiral of the Fleet, Sir Fairfax Moresby GCB). The western side of the passage as it passes through the reef has many great dive locations. The reef here is called Sinavi Reef and this spot is on the eastern end of the reef. As you leave the harbour and enter Basilisk Passage you will see a light on the right. This is the main port channel marker for the passage. To the south of the light is a dive site called Shark Inn. 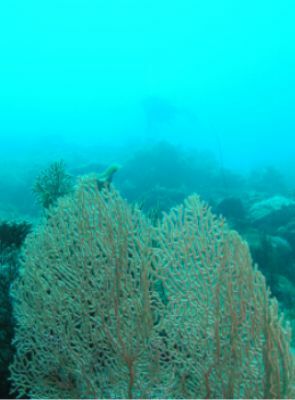 The reef here rises from perhaps 600 metres in the centre of the passage to about six metres on the top. Once you have anchored you drop to the bottom and head to the east. The reef drops gradually to 25 metres and then a wall drops to over 40 metres. The wall has some nice medium sized gorgonias on it and there is all the normal smaller tropical fish. You can also see flutemouth and some cuttlefish, You can gradually rise up the wall as you go to the north or south (depending on current if there is any). You can sometimes see sharks here. On my dive we saw a lot of huge mackeral as well as many firefish along the wall. Once you get to the top of the wall, look across the sandy patch (if you have headed north) and you will see, if you look carefully, thousands of garden eels, their heads and bodies swaying in tune with the current and surge. Move forward and they disappear, pulling themselves back into their holes. Garden eels are quite tiny, more like large worms in appearance. As you cross the sand, look for anemones towards the reef and you will find some with clownfish, both the pink anemonefish and three-spot dascyllus. Follow the shallower part of the reef back towards the anchor and you will soon find yourself back at the boat. This was a nice dive, visibility over 20 metres and water temperature 25.5°.